Dropbox Referrals - Get 16 GB of extra storage on Dropbox, forever. Boost your Dropbox storage by up to 16 GB, forever. ...and let the magic happen! You provide us with your Dropbox referral link and we will make sure you receive 32 referrals. Dropbox will automatically reward you with 500 MB per referral, resulting in a total of 32 x 500 MB = 16 GB of extra online storage! Referrals can get you a maximum of 16 GB of extra Dropbox storage. In case you've already referred some friends, our service will fill up your extra storage to the 16 GB limit. Referral bonus space will not expire! We only need your unique referral url. No time to wait? Consider our pre-made accounts. Referrals are delivered gradually over the next 20 days and you should receive your first few referrals within a day! Please be aware of other websites trying to copy our service and offering delivery times within a day. This simply does not work; the referrals will not be accepted by Dropbox. Besides that, most of those websites are just pure scam. Spring is in the air! Organize your files and backup your most valuable ones in the cloud. for a similar price as one month's worth of Dropbox Pro. That's even cheaper than a USB flash drive. Go to www.dropbox.com/referrals (just click the link) and copy your unique referral link. ...and click the button to finish your order at PayPal.com. No worries if you don't have a PayPal account, you will also have the option to pay by credit card. That's it! Just sit back while we provide you with 32 referrals. These will be delivered gradually over the next 15 days. Once a referral is delivered, Dropbox will send you an email. Referrals will also become visible at www.dropbox.com/account/plan. Say goodbye to your dropbox storage issues and enjoy your extra 16 GB! No time to wait for referrals? We've got you covered! 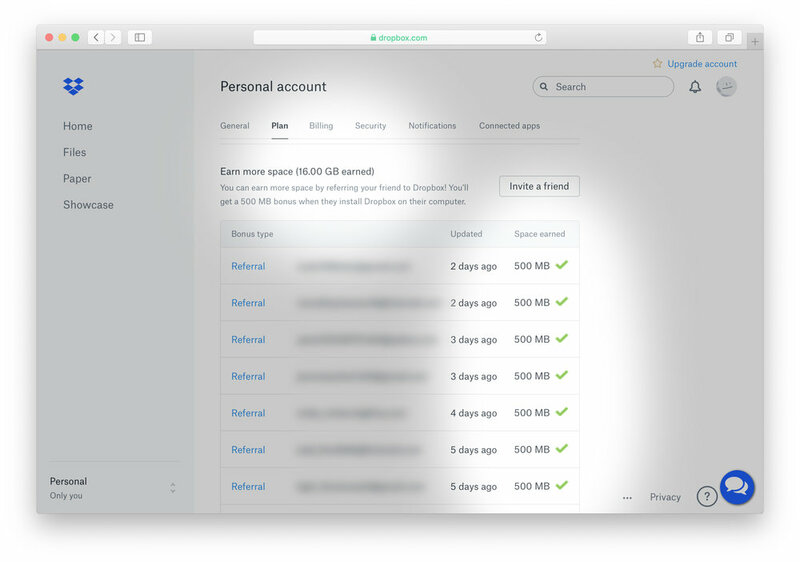 Get a pre-made Dropbox account with maxed out referral space (2GB free storage + 16GB referral bonus space = 18GB of permanent cloud storage). We will send the login details to your PayPal email address within a few minutes. You can change the email and password of the account to your liking of course. Looking to expand your existing Dropbox account instead? Get 32 referrals. Many (small) businesses have used Dropbox Referrals to solve their cloud storage issues. Please contact us for bulk orders of at least 10 accounts. Don’t just take our word for it. Have a look at the reviews on our Facebook page. Great service. Totally worth every penny. Works exactly as described. Definitely worth the money! It does what it promises! 16 GB plus forever on Dropbox . Each day will be added 500 MB up to 16 GB!! Maxed out my referrals storage space. 2 thumbs up to the guys behind this. Worth every penny for the service they provide. It worked exactly as described. Referrals came in At couple a day until I was maxed out. We love to hear back from you. Feel free to drop us a line.